Gustiamo (all of us) went to the Consulate of Argentina, the other evening, to taste some of that country’s best extra virgin olive oils. God forbid you should think we are only partial to Italian olive oils! 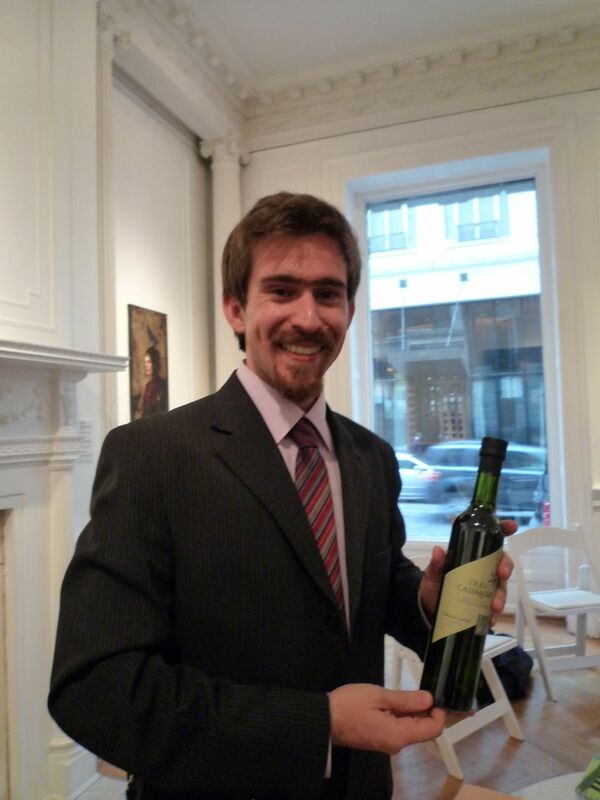 This young man is Victorio Piuzzi and he makes Olio Casiraghi in Mendoza. Casiraghi is the name of Victorio’s grand father who started the small farm (they make only 20,000 bottles). We talked to Victorio at length and it was like talking to one of our real passionate and proud Italian olive oil maker. He even speaks Italian! We liked his light blend made with arbechina, nevarillo (both originally from Spain) and frantoio olives and his fruity monocultivar made with Arauco olive. This Arauco olive is the only true Argentinean variety and it has a very interesting story: in the 18th century, Spain ordered the eradication of all olive trees in Argentina, fearing the competition. Somehow, from all the various cultivars, this Arauco was developed as a local plant. Another very interesting point is that they don’t use much olive oil in Argentina: only 1/2 a liter per person per year. Hence, their need to export. Production in the North and the Center of Argentina, differs tremendously: while the North can yield 40,000 kilos of olives per hectar, in the Center of Argentina, you can only have 8,000 kilos. Much fewer olives, but much better quality. Victorio’s farm is in Mendoza, which is smack in the center of Argentina and this is another reason why his olive oil is so good. Bravo Victorio, next time in NYC come to visit us in the Bronx; we’d love to have you taste our olive oils! Ha stato veramente un piacere ti conoscere! al olio di oliva, ed diventa sempre un bel momento spiegare la realtà dei nostri prodotti. Rimaniamo sempre in contatto, si hai bisogno di campioni della nuova raccolta fammi sappere, magari l´avro preste per partire in Agosto.